Shout out to Fox College PTA program! It was a fun afternoon on December 19th at Fox College. 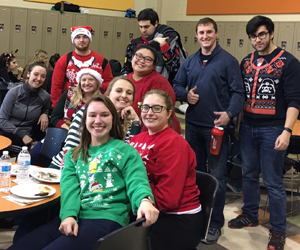 Not only was it the day for students to wear their festive holiday sweaters - but to enjoy a pizza party brought to them by IPTA staff! For the second year in a row, Fox College was the only school program to earn 100% participation of students donating to the IPTF for the 2018 #GivingTuesday. Not only were the students rewarded with a pizza party, but they will continue to hold the naming rights for next year's IPTF student fundraising challenge.